Can You Help Identify These Fine Fellows? "We have at the Hall an ellipsoidal framed piece that has seven cameo photographs pasted to an old thin-wood mounting board. The photographs are of good quality, but appear to have been cut out from some other source -- a magazine, perhaps. I also have a suspicion [the photos] have to do with the Bund von Freie Gemeinden von Nord Amerika." And just today, Michael Whaley wrote to announce, "The portrait on the top left is of Michael Biron, founder of Der Freidenker (1871), and the 4th Speaker of the Painsville Freie Gemeinde (from 1897-1902) in Franklin Township, WI. 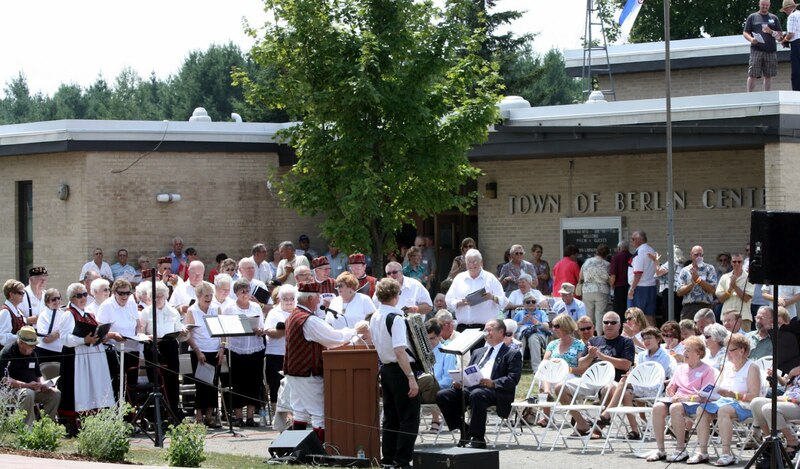 The Painesville congregation is often identified as the first Freie Gemeinde in Wisconsin. 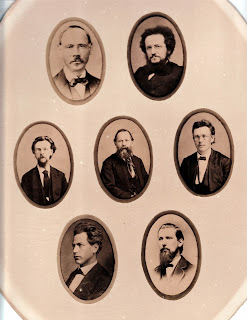 It was organized in 1851 under the name "The First Free Christian Congregation," but in practice it probably came to more closely resemble other Freie Gemeinden (e.g., Sauk County's) during Christian Schroeter's tenure as the congregation's 3rd Speaker (1857-1890), as in 1872 it wrote a new constitution and renamed itself the Free Congregation at Painseville. Looking at the Cooper article, the fellow on the lower right might be a younger Friedrich Schünemann-Pott, speaker of the Freie Gemeinde in Philadelphia from 1854 to 1871, when he accepted a call from San Francisco. 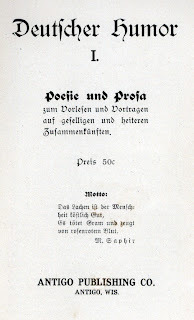 Schünemann-Pott also edited the Blätter fiir freies religioses Leben, from 1856 to 1872, a journal that, according to Cooper, "contains much valuable information about the Free Congregations, [including] letters from readers, reports of local activities such as reading circles, dramatic programs, concerts, lectures, and libraries, and articles on science, history, philosophy, and literature." Perhaps this image comes from one of the Free Thought journals? 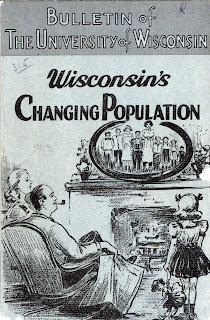 This image, showing the fondness families often have for their ancestors, is the cover of The Bulletin of the University of Wisconsin from October of 1942. 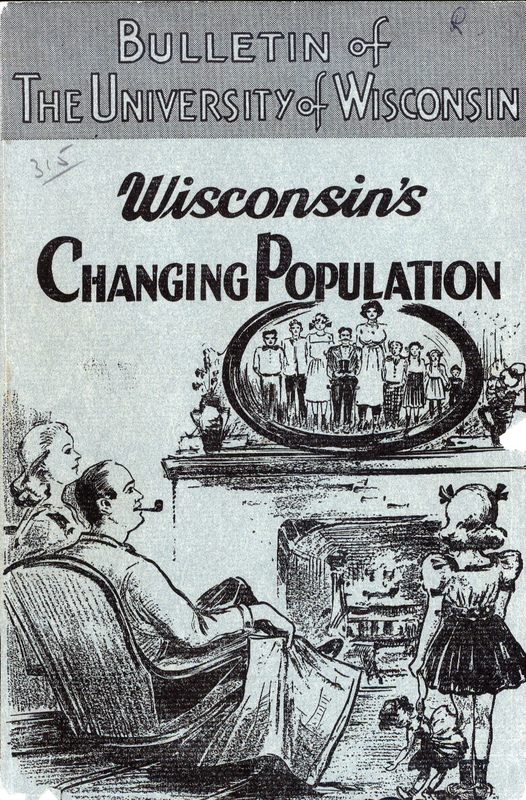 The issue's title is "Wisconsin's Changing Population," and it features interesting summaries under the heading of Settlement and Population Growth, such as: Streams of Settlement, The Coming of the British, Yankee farmers Come from New England and New York, Continental Europeans Find Opportunities Here, and Census Reflects Changes in Place of Birth and Nationality of State's Citizens. Here is one quote, up for discussion: "Dairying was initiated in Wisconsin under the leadership of a few Yankees who had sensed the bankruptcy of wheat culture and who were seeking a more solid and permanent base for agriculture. But dairying was accepted and made a practical working farm industry by the Germans and Swiss preeminently. 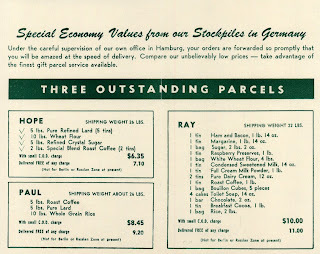 The Yankees did not wish 'to be tied to a cow,' but the regularity of the work and of the income were the very things which appealed to the industrious Germans and Swiss. They had brought with them for Europe a familiarity with cheese and butter-making. Their practical pioneering became the basis for the Wisconsin dairy industry of today." The frontispiece of the issue is the famous map, in color, by George W. Hill, "People of Wisconsin According to Ethnic Stocks, 1940." Hill used census statistics and other state information to create his map. 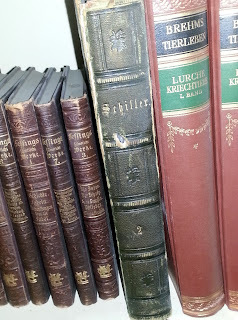 If you look at the spine, just below Schiller, you can see a hole, as if the book were had been burrowed into by a large bug or bookworm. 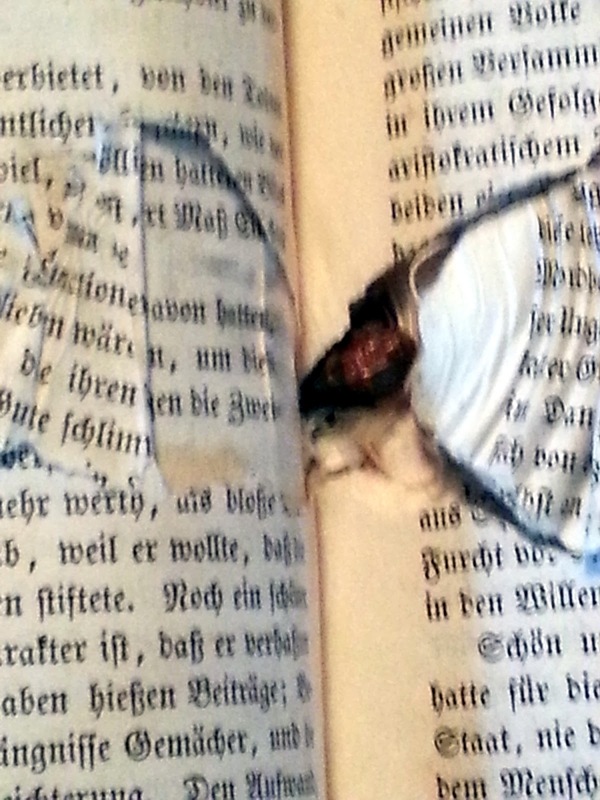 Open the book, and you find this damage, which seems unusually drastic. And what is that in the gutter? Is that the worm!?! 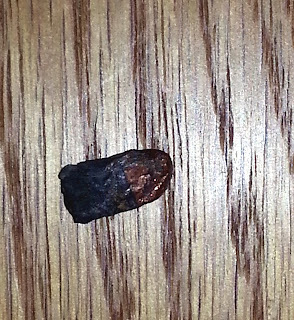 Not a worm at all -- turns out to be a bullet! 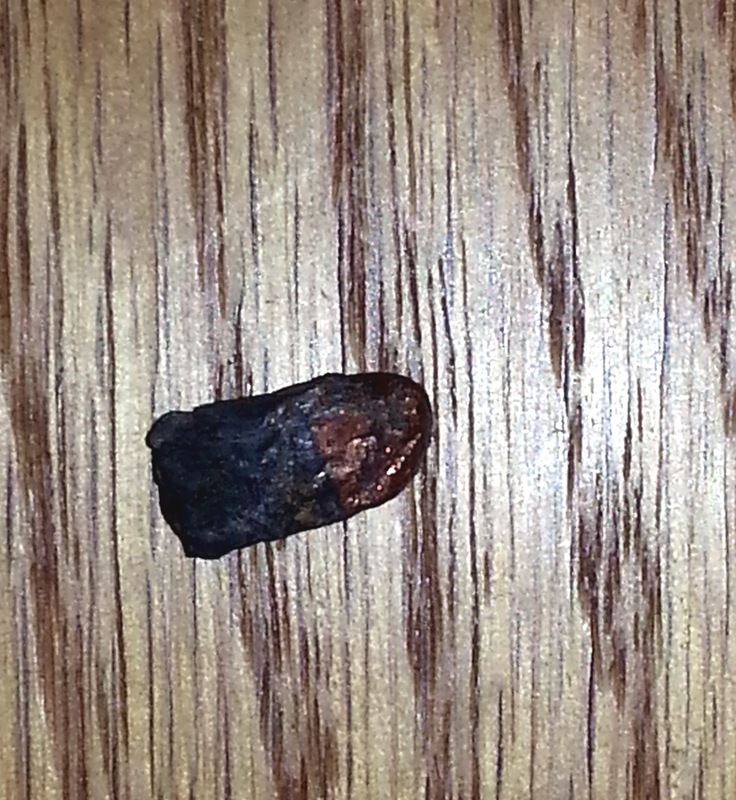 Can anyone identify this bullet, particularly in terms of how old it might be? We have to wonder what took place in someone's library long ago: An accidental discharge? A life spared by bad aim? We will probably never know, but the mystery of it keeps this odd volume in our library. PS The book's title page is stamped with the name "Edward T. Berkanovic," who we know was a lawyer in Milwaukee and who, in 1990, donated six other items to our Institute. 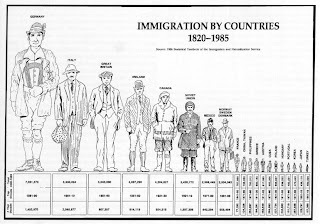 Here is information on a course about the immigration experience of German-speaking peoples, offered by Prof. Johannes Strohschänk and Bill Thiel at the University of Wisconsin–Eau Claire. 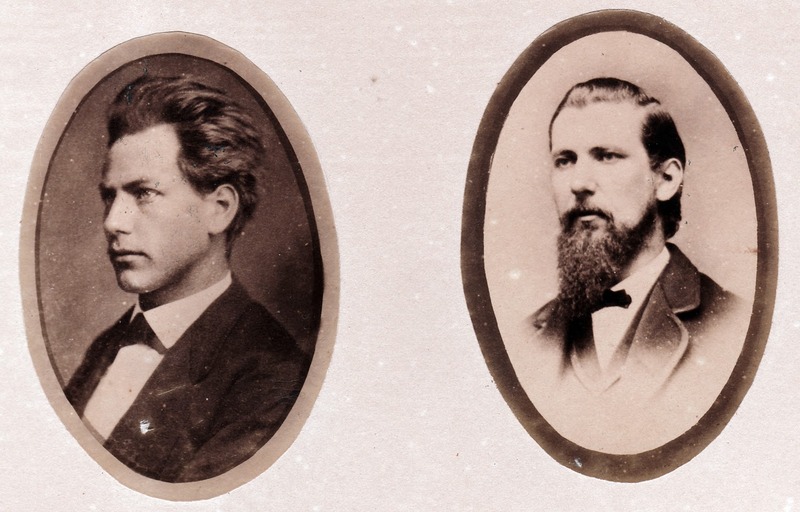 Their honors course, titled "From the Feudal to the Federal State: 19th Century German Immigration to Wisconsin," will be offered Mondays and Wednesdays from 4:30 to 5:45 beginning January 23, 2013, and will be taught in English. 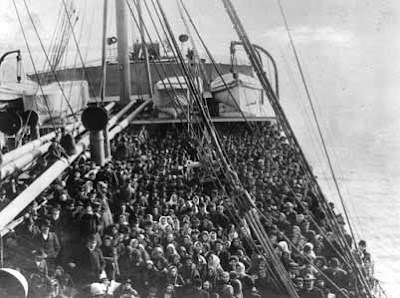 "Why in the course of a century would some 7 million people pick up and move to the other side of the world and begin a new life? And why Germans? And why so many of them to Wisconsin? In this course we will try to find answers to these and other questions by looking at German history, U.S. history, and at the history of our state from the common people’s point of view. 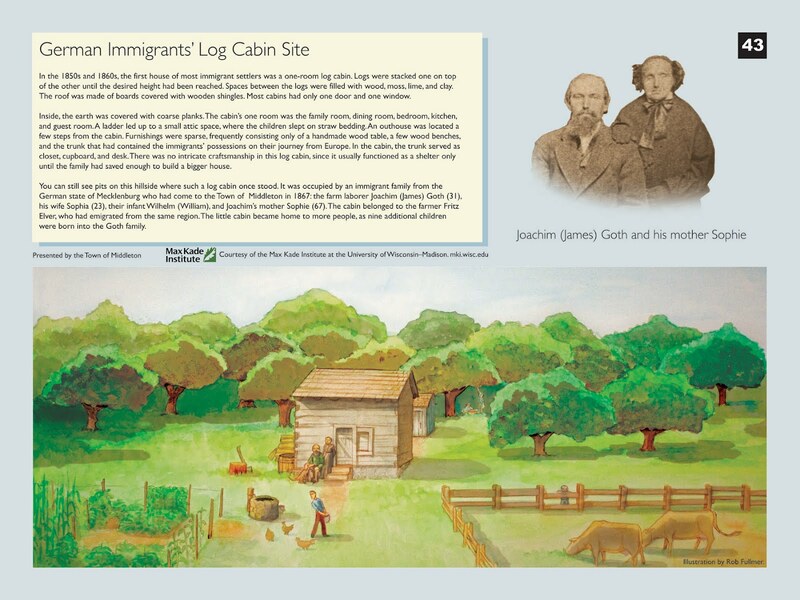 We also will try to retrace the emigrants’ every step, from their painful departure to the arduous sea voyage to raising the first primitive cabin in the woods of Wisconsin. (And – where were the Native Americans?) 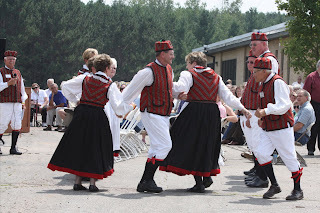 In the end we should be able not only to have a more sophisticated assessment of the German element in Wisconsin beyond beer and bratwurst, but also to see today’s migrations with a more educated and critical eye, as well. Maybe even more important in our modern world of infinite restlessness will be an appreciation of what “home” really means." Once again, we would very much like to hear about other courses offered on the topic of German immigration and/or the German American experience! Here is the striking logo of The Antigo [Wisconsin] Publishing Company, founded in 1898 by the Lutheran minister Rev. Albert Friedrich Wilhelm Grimm. Grimm was born in Petershagen, Pomerania, in 1864 and immigrated with his parents to the United States in 1874. He graduated from Concordia Theological Seminary (Springfield, Illinois) in 1888, the same year he married Mathilda Moldenhauer. He served as a pastor in Antigo, Wisconsin, but after the death of his oldest son in 1919, he left the ministry to devote himself to the business of the Antigo Publishing Company. Grimm is best remembered as a prolific author of short stories, plays, recitations, choral works, and novels in German, which he wrote under the (known) pen names of Alfred Ira, E. J. 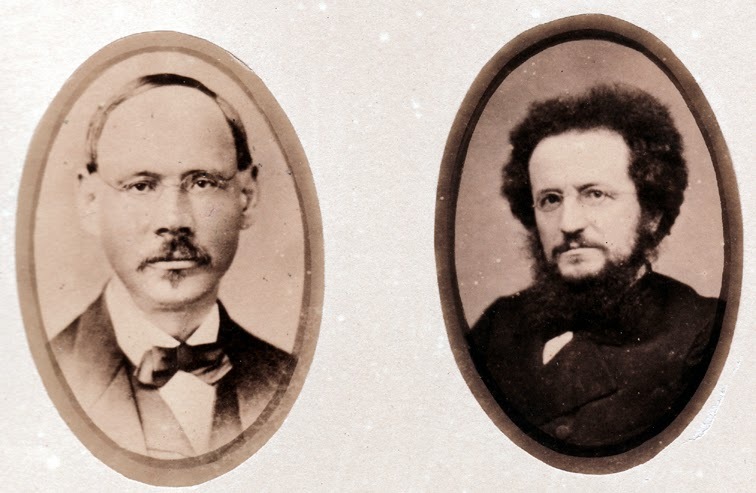 Freund., and E. Stern. He died in 1922 at the age of 59. It is not known if he designed the logo himself, but we are confident this talented German American was quite capable of doing so! For a partial listing of the Dialogues and Recitations published by the company, please click here. Recently donated to the MKI's library is this advertisement for Dr. August König's Hamburger Tropfen, a patent medicine said to be effective against “all sicknesses of the stomach, liver, and abdomen." 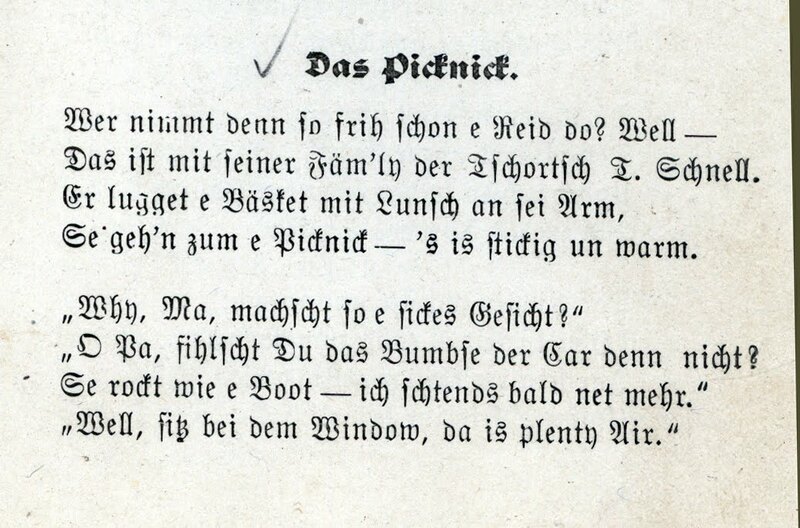 The picture on one side is an image puzzle [Vexierbild in German] titled "Das Picnic," with the words "Wo ist der Mann, welcher stets Dr. August König's Hamburger Tropfen gebraucht?" 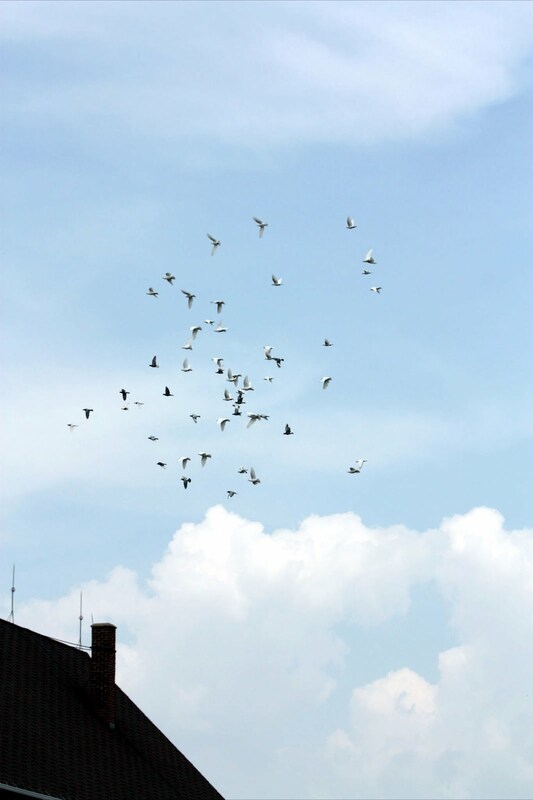 ["Where is the man who always needs Dr. August König's Hamburg Drops?"] in old German script below. The images of the picnic-goers can be seen to form a much larger image of a man pouring a bottle of the nostrum (it may help to view the picture sideways). The reverse side describes the product and provides directions and cautions for its use. The elixir was manufactured and sold by A. Vogeler & Co., of Baltimore Md. 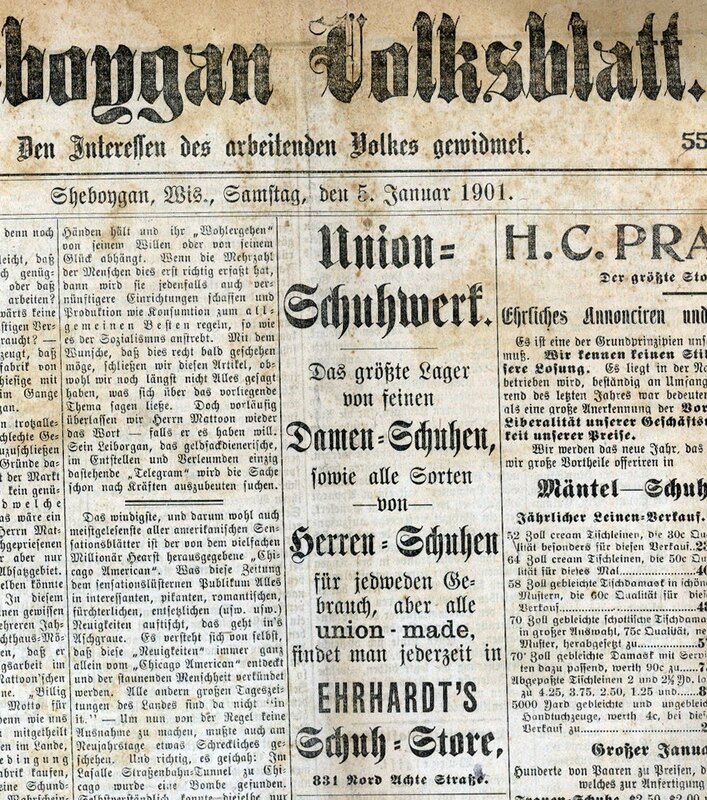 Online searching shows that August Vogeler was born in Minden, Germany, in 1819, and emigrated to the United States in his twenties. 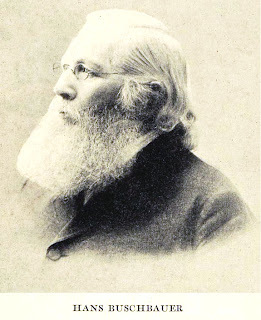 In the 1850s or early 1860s he established a drug business in Baltimore, Maryland, which came to sell a range of patent medicines under the name Dr. August König, including Hamburger Tropfen, Hamburger Brustthee [breast tea], and Hamburger Kräuterpflaster [herbal plaster], as well as St. Jacob's Oil and Dr. Bull's Cough Syrup. Like many such products of the time, their ability to influence one's health is questionable, and their contents may actually have contained harmful ingredients. August died in 1908. At the bottom of this side of the card is printed: F. M. Findeisen, New Cassel (Fond du Lac County), Wis. Internet searches show that Frederick Maximilian Findeisen was born around 1836/1837 in Prussia and arrived in New York in 1862. That same year he married Ernestina in Fond du Lac. He naturalized as an American citizen in 1865. He owned a grocery store ("Dealer in Dry Goods, Boots & Shoes, Hardware & Groceries") in New Cassel, which may have been built in 1874, and he served as the New Cassel postmaster in 1868. F. M. Findeisen died in 1905, and is buried in Campbellsport, Fond du Lac County, Wisconsin. Two interesting images recently stumbled upon -- click on them to enlarge! As is often the case in America, the German immigrant is pictured as "typically" Bavarian, perhaps because this stereotype is the one easiest to capture and has the most resonance for us. No doubt a dissertation could be (has been?) written on figuring out why! 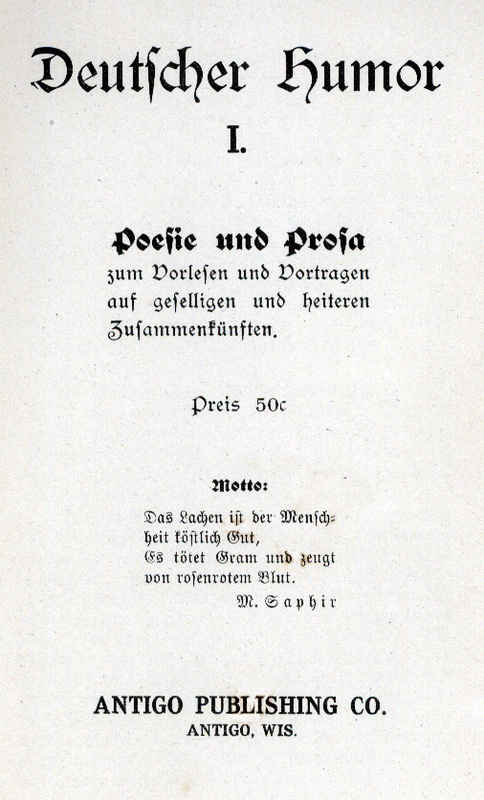 The second image comes from Paul H. Kuntze's Das Volksbuch unserer Kolonien, published in 1938 in Leipzig. 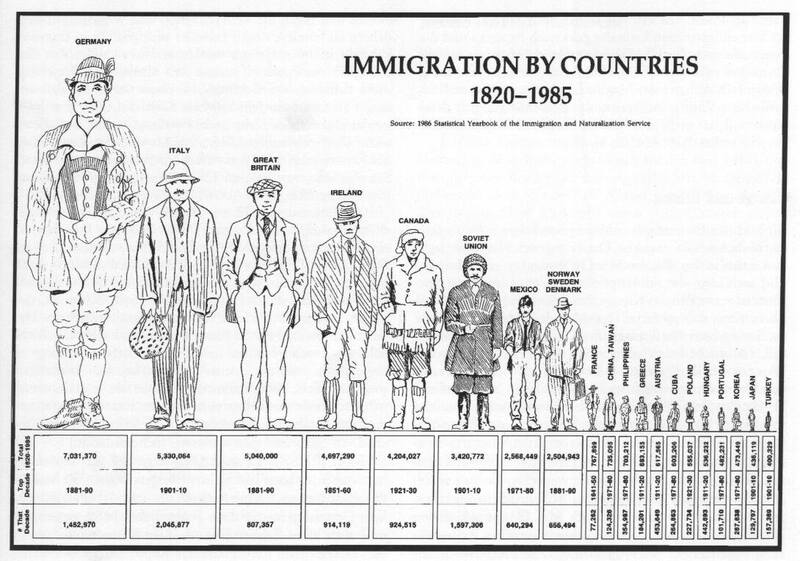 Note the colossus standing in North America to represent the numbers of German-speaking immigrants! 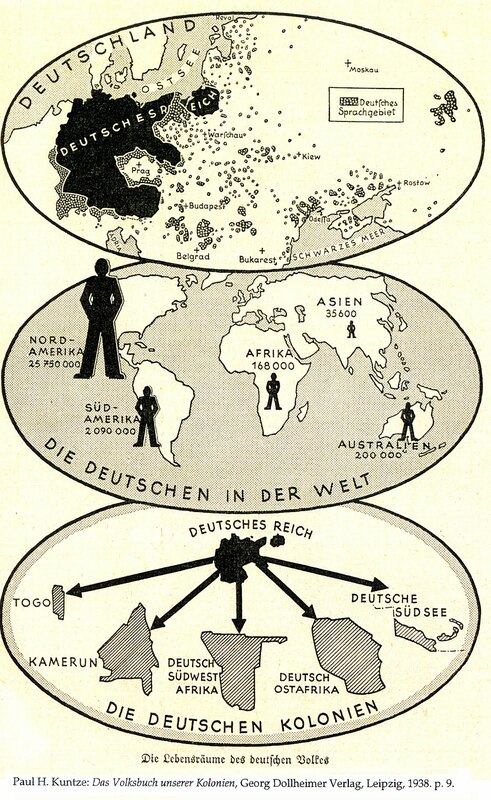 The caption here uses the now-loaded term Lebensräume -- we could sanitize the term and translate the caption to read: "The habitats of the German people." Still, these images likely had political weight and propaganda value for the National Socialists at the time. 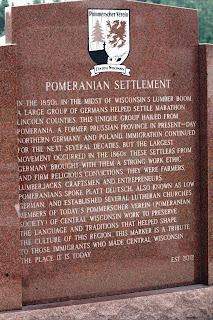 On July 15, 2012, a ceremony was held in the Town of Berlin, Marathon County, Wisconsin, to unveil a granite marker commemorating the Pomeranian immigrants who settled in the area. 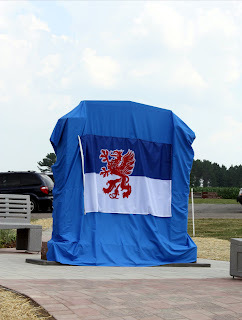 Organized by the Pommerscher Verein Central Wisconsin, a heritage group that studies the history, culture, and Low German (or Platt) language known to their ancestors, the celebration included singing, dancing, speeches, and even a release of pigeons as the monument was unveiled. 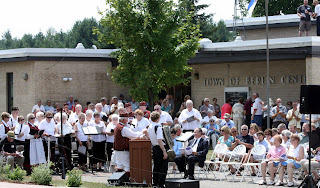 The songs included a version of "On Wisconsin" and "You Are My Sunshine" in Platt, as well as "Das Pommernlied," which was written in 1850. 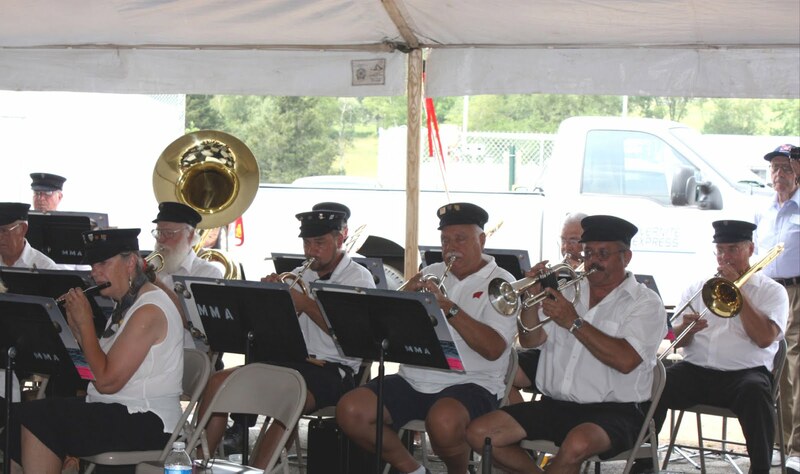 The group is believed to be the first to translate the Wisconsin state song into a dialect language. 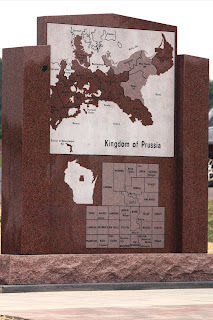 The six-foot-tall marker is made of locally quarried red granite; not only is red granite Wisconsin's state stone, but many Verein members and their families have found employment at such quarries. 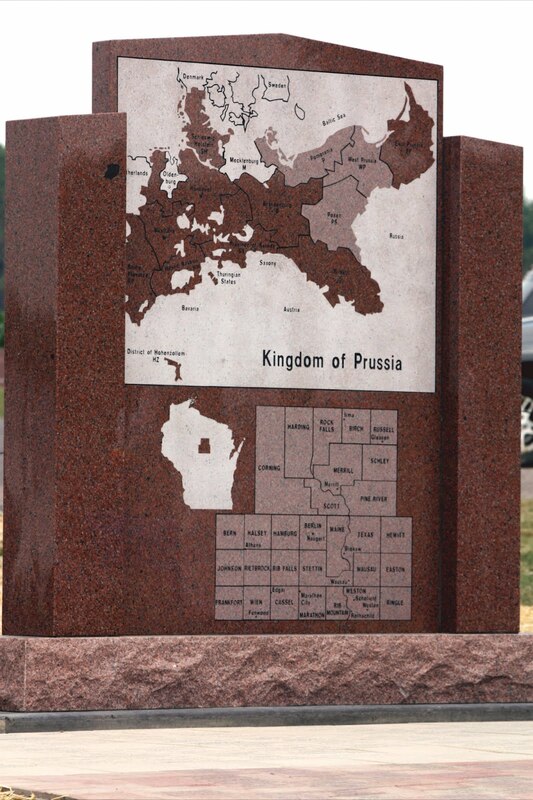 One side of the marker features a narrative about the Pomeranian settlement of central Wisconsin; the other shows a map of the Kingdom of Prussia, identifying the area where large groups of immigrants originated, as well as a map of Wisconsin, highlighting the counties of Marathon and Lincoln where so many Pomeranian immigrants settled—often in towns with names like Stettin, Hamburg, and Berlin. In addition, the ground surrounding the marker contains 149 tiles engraved with the names of original immigrant settlers and nearly 400 commemorative bricks established by descendant families. There is a plan to compile a collection of stories about the immigrants whose names adorn the monument. Here we take a peek at Lustige Sachen für Mädchen zum Lachen. 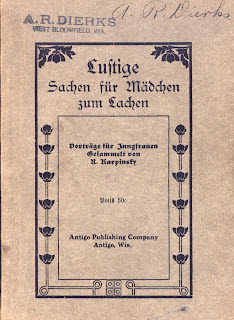 Vorträge für Jungfrauen [Humorous things/recitations to make young girls laugh], compiled by R. Karpinsky and published by the Antigo (Wisconsin) Publishing Company. We haven't been able to determine a date of publication, but it was most likely in the early 1900s. 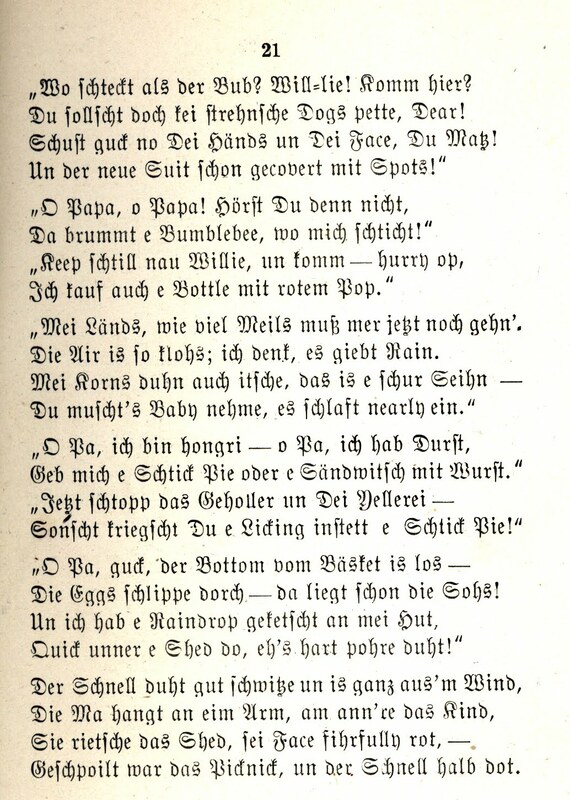 A number of the pieces in this collection, all of which are meant to be read aloud, are in German dialects, and are attributed to German/Swiss Americans, such as Louis C. Marolf of Iowa and Emil G. Brill of Chicago, or have a German-American flavor, such as "Beefsteak-Lied," "Buttermachen auf der Farm" and "Das Picknick." 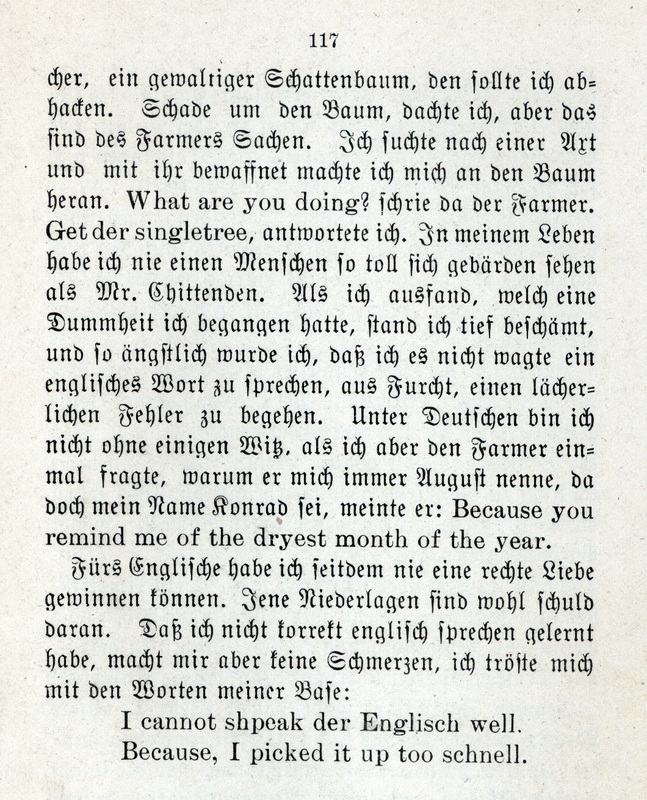 This last one, reproduced below, is heavily Denglish, a combination of English and German (and that rather a dialect itself), rife with amusing phonetic spellings such as "Tschortsch" for George, "strenhnsche" for strange, "Seihn" for sign, and "hongri" for hungry; and outrageous phrases like "Er lugget e Bäsket mit Lunch an sei Arm," "stickig un warm," "ich schtends bald net mehr, "hurry op," and "Jetzt schtopp das Geholler un Dei Yellerei / Sonscht kriegscht Du e Licking instett e Schtick Pie." Internet research shows there was a Rev. Rudolph Albert Karpinsky, born 1871 in Augusta, Eau Claire County, Wisconsin, his parents having come to America from Germany in 1868. In 1900 Rudolph received theological training and graduated from Concordia College in Springfield, Illinois, and in this year he also married Amanda Zank of Augusta, Wisconsin. He served as Lutheran minister at Bern, in Nemaha County, Kansas, until 1903, when he was transferred to Belle Plaine, in Shawano County, Wisconsin. In 1911 he was installed as pastor at the Lutheran Church in Manawa, Waupaca County, Wisconsin, serving there until 1946. He died in 1947 and is buried in Green Bay, Brown County, Wisconsin. 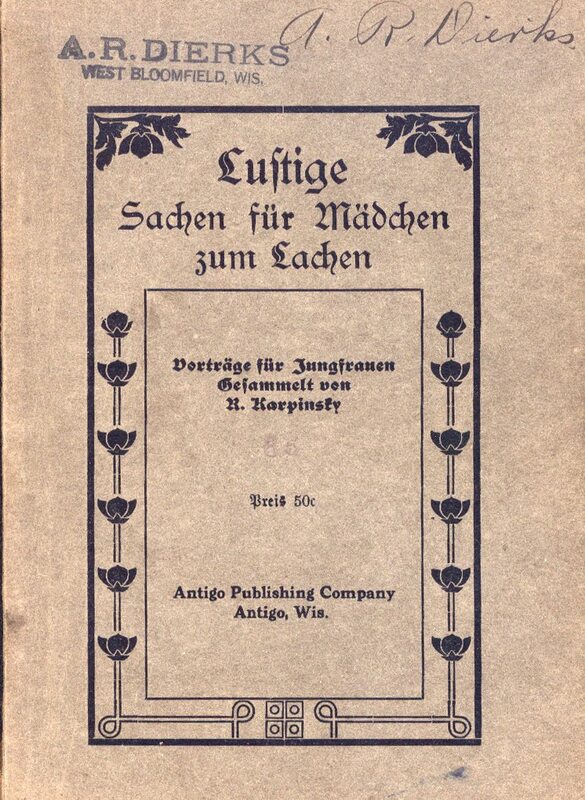 Our copy of Lustige Sachen für Mädchen zum Lachen is stamped and inscribed "A. R. Dierks" of West Bloomfield, Wisconsin. Online information suggests A. R. Dierks was a school teacher from 1921 to 1943 at the Christ Evangelical Lutheran Church and School in Weyauwega (West Bloomfield), Waupaca County, Wisconsin. 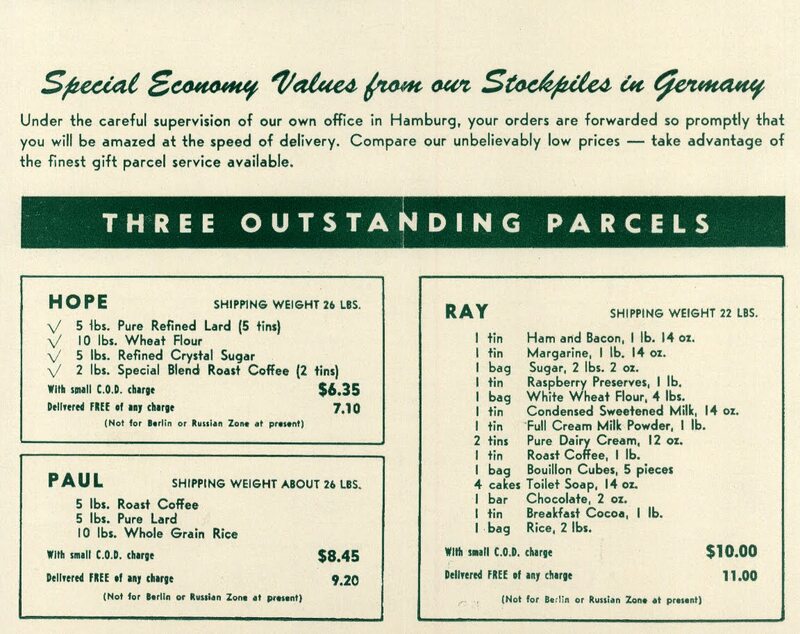 Among the extensive materials in the Frank and Herta Gross family papers is documentation related to the 500-plus care packages Frank sent to relatives and friends in Germany after World War II. 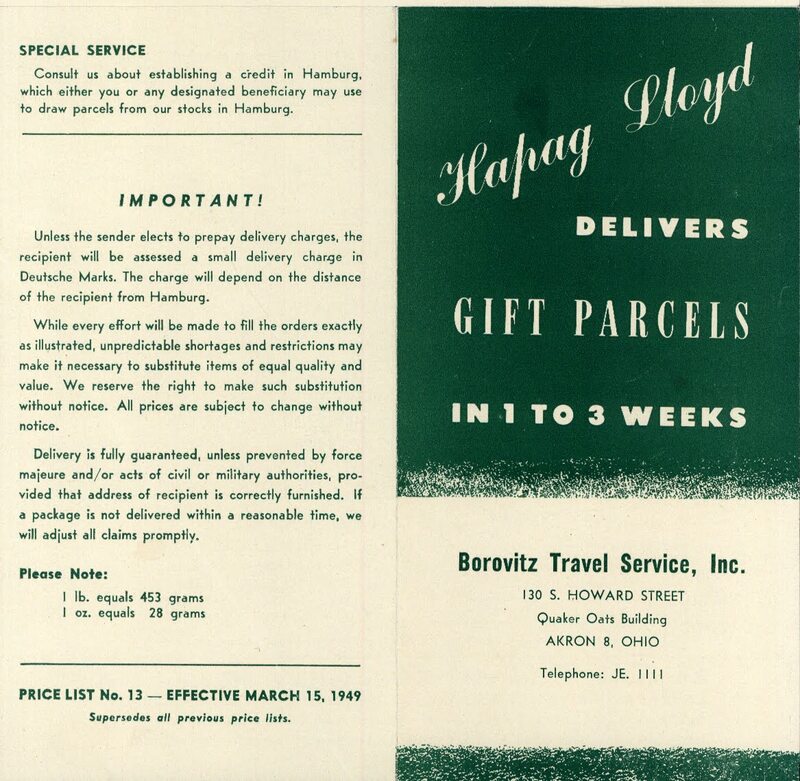 The images here are from a Hapag-Lloyd's advertisement. 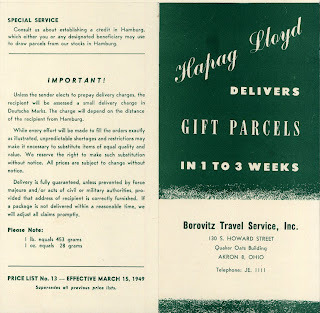 Note the names given to some of the options, and also that "in view of the existing uncertainties, only parcels CARL, LAURA, MARIA and HANS are available for the Russian Zone (not for Berlin) via U.S. Parcel Post." 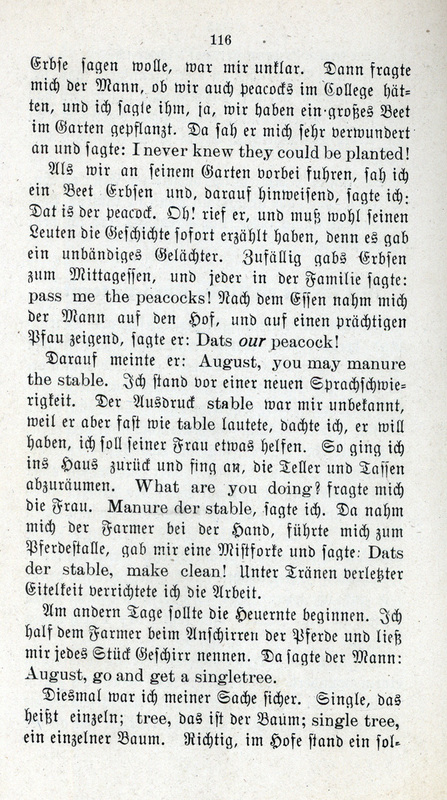 This humorous dialog, intended to be read aloud at Christian social gatherings, is from a book entitled Deutscher Humor I. Poesie und Prosa zum Vorlesen und Vortragen auf geselligen und heiteren Zusammenkünften. The book was compiled by a paster (perhaps Albert Friedrich Grimm) and published by the Antigo (Wisconsin) Publishing Company, probably in the early 1900s. 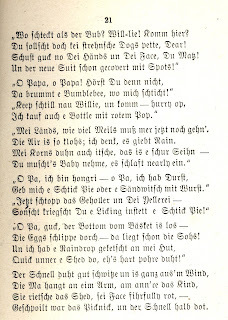 A few of the pieces in the book are in German dialects, but only a few near the end, such as "Wie ich die englische Sprache lernte," have a distinctly German-American flavor. While it is impossible to determine the authenticity of the story, it is certainly rife with realistic details, as well as a sense of pathos. The speaker claims to have come from Germany as a 15-year-old boy and taken service with a farmer by the name of Chittenden, working for 15 dollars a month. "I'll never understand how he expected to get his money's worth from such a green boy," he exclaims, "though he later told me I gave him an enjoyable summer." 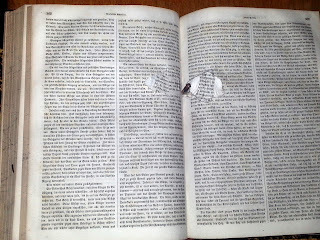 The rest of the piece details several episodes wherein the speaker, who confesses to having been quite vain in his youth, has embarrassing difficulties with the English language; indeed, it is stated that the memories of these injuries to his pride still cause him pain to this day. Among the incidents: telling others his father was a "begger" as he attempts to pronounce the word "baker"; trying to discern what a "peacock" is and deciding it must be a type of vegetable, like a beet -- which leads to humor at his expense around the dinner table; being told to muck out the stable and, thinking this unfamiliar word sounded much like "table," beginning to set out the cups and plates; and, upon being asked to get a "singletree" (a crossbar to which the traces of a harness are attached), grabbing an ax to cut down the lone shade tree near the house. Eventually he becomes so fearful of making such humiliating mistakes he doesn't dare to speak a word of English. 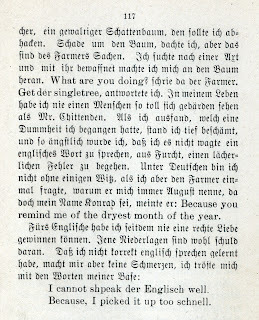 And, although he insists he can share jokes among other German speakers, he tells us the farmer calls him August -- even though his name is Konrad -- because he reminds the farmer "of the dryest month of the year." The speaker concludes that these defeats kept him from developing an affinity for the English language; his inability to speak it correctly, however, doesn't bother him, for -- in the Denglish words of his aunt -- "I cannot shpeak der Englisch well / because I picked it up too schnell." By the way, the 1900 census shows a Bronson Chittenden living in Neva, Langlade Co., WI, 7 miles from Antigo. 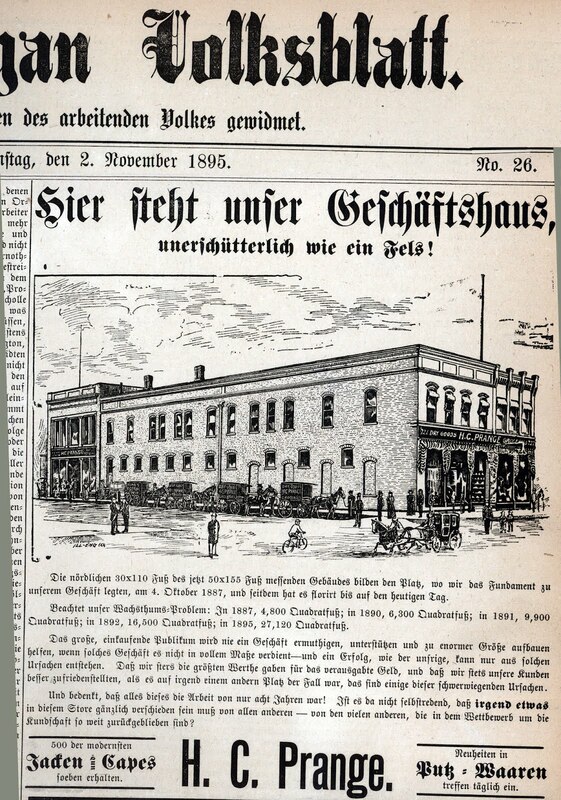 Here are two advertisements from the Sheboygan Volksblatt, a weekly German-language paper published by the Central Labor Union and "dedicated to the interests of the working people." This ad for Prange's department store appeared in 1895, a time of economic depression that began with the Panic of 1893. The ad proclaims reassuringly: "Here stands our store, as steadfast as a rock." 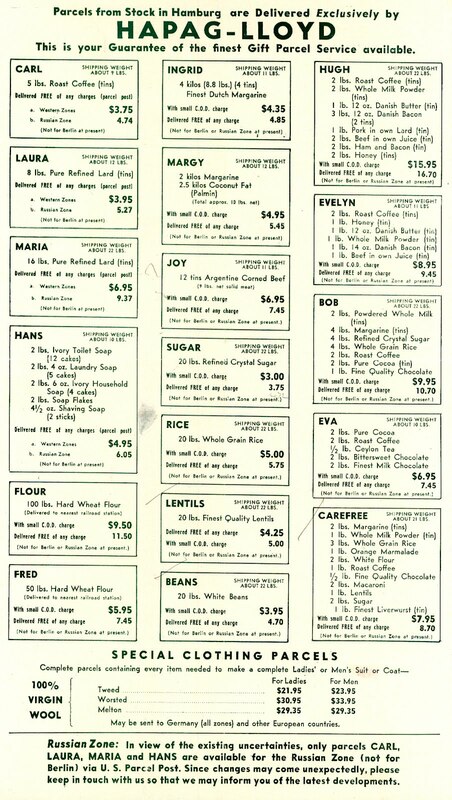 Established in 1887 by Henry Carl Prange, the son of farmers who had immigrated to Wisconsin after the Revolutions of 1848, the business flourished, expanding from an initial 4,800 square feet to 27,120 square feet by 1895. According to Wikipedia, Prange "sold everything from cradles to coffins and, unlike his local competition, also extended credit to local farmers and purchased their crops at harvest-time. Soon he was the preferred store for the farming community of Sheboygan. 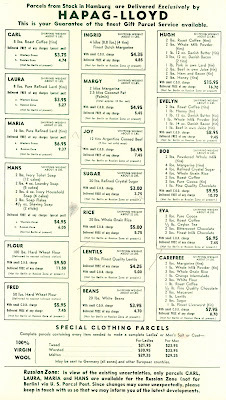 German and English was spoken by all the store's employees from its founding until 1941." 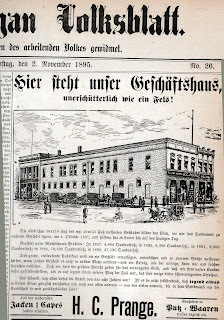 This second ad from 1901 for Ehrhardt's Schuh-Store recognizes the paper's working-class audience by promoting their "union-made" footwear for any purpose. We haven't been able to discover much more about Ehrhardt and his business. 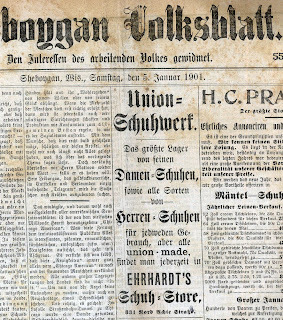 Oscar Loebel, who was born in in Leipzig in 1864 and came to the United States in 1889, was assistant editor of the Sheboygan Volksblatt from 1895 until 1897; he then became managing editor of the paper, holding that position until May of 1901. Lodi high school in Wisconsin and its partner in Germany were honored by the German government for their outstanding exchange program. Approximately 900 German cultural exchange or cooperation programs were considered for the recognition, programs funded by the Pädagogischer Austauschdienst cultural exchange office. Three programs received monetary awards and another 10 received special recognition, including the partnership between Lodi High School and Schwalm Gymnasium in Treysa, Germany, part of the Hessen-Wisconsin High School Student Exchange. Ute Promberger, Easleys counterpart in Treysa, writes that the first exchange between the schools taught them the students needed a topic to keep them going when visiting the partner schools--something besides merely observing school in another country. I really wish others could have an understanding of what we saw. Pictures, stories, and textbooks cant do justice to the things that happened there like walking the same pathways that many captured, innocent people walked.... Knowing that 56,000 prisoners died at Buchenwald made unthinkable emotions run through my mind when I saw the hanging rooms, the small cells, and the crematoria. She advises not worrying about the many things that can go wrong--they can be part of the educational process for students. Easley adds that Lodi educators would be happy to advise any district wanting to embark on a similar effort. Only in America . . .
. . . would this German-American farce work so well. 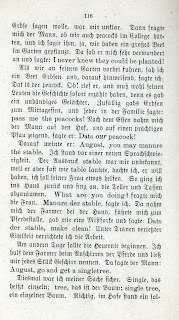 Here is one page from a 16-page Dialog by W. Heinecke, entitled "Sell war ä hard Case" (That was a hard case). 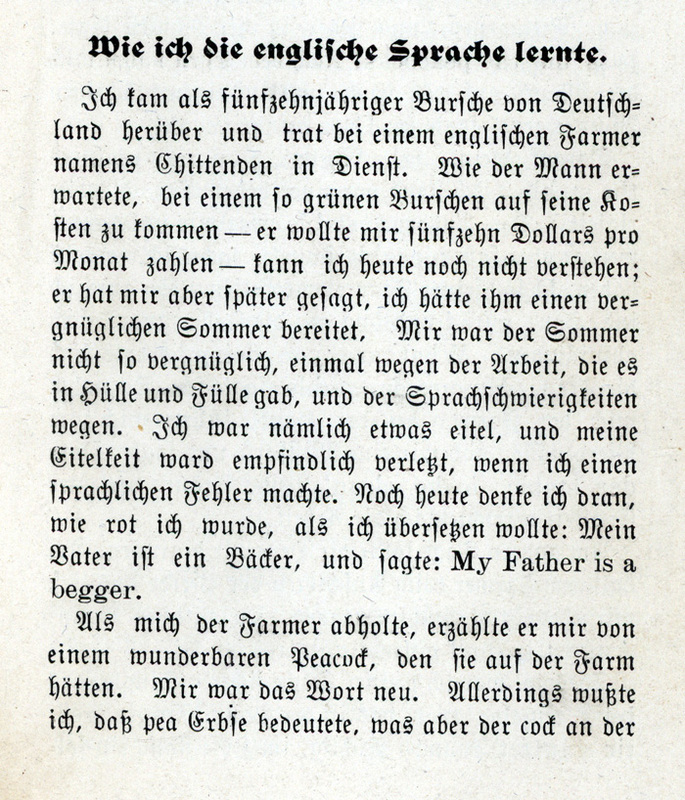 It was published in the early 1900s by the Antigo (Wisconsin) Publishing Company in a series for Jugendvereine (youth clubs), and features 8 male roles: Der Richter (an English-speaking judge); Farmer Schmierkäs; Farmer Käsewurm; ein Pennsylvanier; and four Zeugen or witnesses, Heiner, Jochen, Klas, and Seppl. 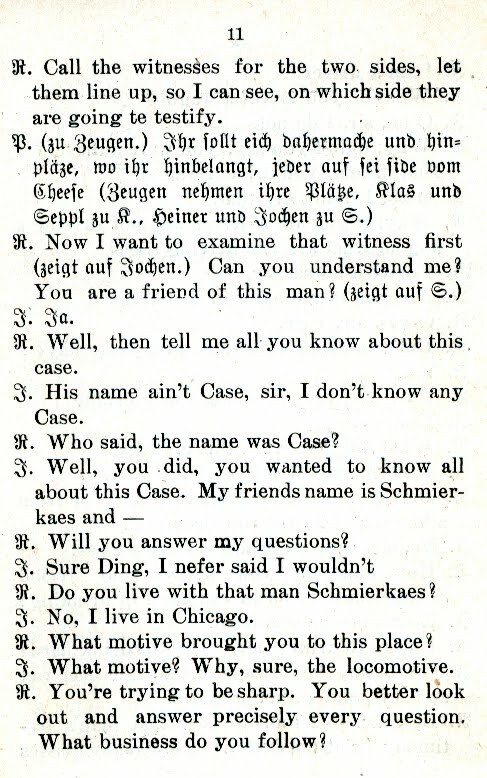 A lot of the humor comes from the German-speakers, who seem to be quite the lovers of beer, misunderstanding the judge. For example, when the judge thunders, "Stop now, what do you want here?" Käsewurm asks, "Wohnt hier. . . wer wohnt hier?" (Lives here, who lives here?) or the same character hearing "schöne Tag" (nice day) when the judge says "I can't understand your talk." 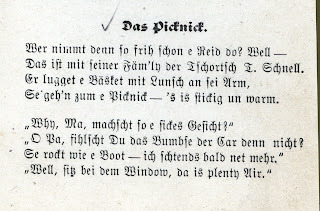 We haven't yet discovered much information on W. Heinecke, except that he wrote several of these playlets that were published in Antigo, with several featuring the character Seppl, including "Seppl läßt sich photographieren," "Seppl will reich werden" and "Seppl macht Geschäfte." 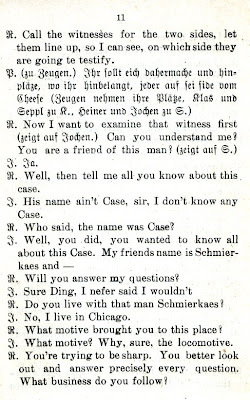 Given the prevalence of Pennsylvania German dialect in the works we've seen, Heinecke may hail from that state, but we don't know for certain. If anyone has additional information on Heinecke and these humorous plays, do contact us at the Max Kade Institute! My grandfather, Francis A. Hoffmann, wooed my grandmother, Cynthia Gilbert, while he was a young Lutheran minister stationed in De Kalb County, Illinois. . . . As soon as they were married, grandfather spoke nothing but German to grandmother, who was of pure British antecedents. After about six weeks of this, she did what many young wives do, namely, went home to her mother. She, being a very sensible woman and the mother of fourteen children, made her go back to her Francis when she found that otherwise he was good to her. And she proved an apt pupil, for when they went to Europe fifteen years later, someone told her: "I can tell from what part of Germany your husband comes, but your German is so free from accent, that I can't determine what province you hail from." Needless to say, this pleased her greatly and was quite a feather in her cap." 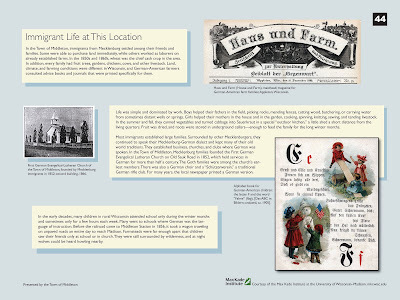 *"Memoirs of 'Riverside Farm,'" Wisconsin Magazine of History, vol. 13, no. 4, June 1930, pp. 356-364. Researching 1860 U.S. Census data for Middleton, Wisconsin, I came across a place I had never heard of. A number of residents with German-sounding names are listed as being born in “Biron.” Where could this country have been? Further research and other clues revealed the place of birth as Bavaria. But why “Biron?” Most likely, when the census taker asked the settler where s/he was born, the answer was “Bayern” which an English speaker could easily sound out as “Biron.” There are many spelling mistakes and other recording errors in the censuses, but Bavaria seems to have been an especially difficult case for the census takers. For example, a significant number of Bavarian immigrants lived in the rural community of Bristol, Dane County, Wisconsin, but only very few people from Bavaria show up in the 1860 census. Instead we find many families from mysterious places called Biron, Biren, Brian, or Bryn—sometimes helpfully amended as Germany/Brian or Germany/Bryn. 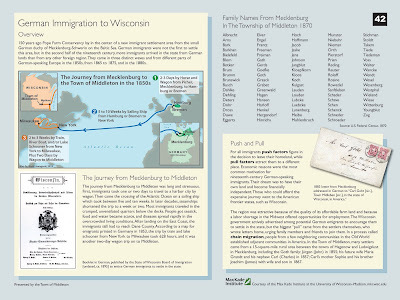 The Max Kade Institute is collaborating with Pope Farm Conservancy in Middleton, Wisconsin, on researching the history of immigration and settlement in the Town of Middleton, particularly the experience of settlers from the small German state of Mecklenburg. 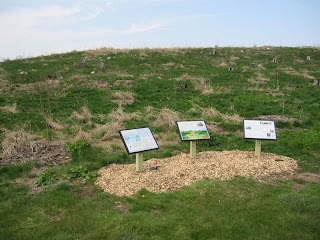 Pope Farm Conservancy , a beautiful hundred-acre public park west of Middleton, features educational trails that interpret the site’s history and unique physical and cultural geography. One important group of visitors are fourth-grade students who study Wisconsin. Recently, the footprint of a settler’s cabin was identified on Conservancy land that once belonged to Fritz Elver, a farmer from Mecklenburg. After 1867 the cabin was inhabited by another Mecklenburg immigrant family: Joachim Goth, along with his wife, son, and mother, and—over the years—nine more children. Joachim worked as a day laborer on the Elver farm. 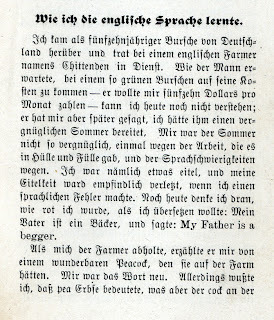 Following the typical chain migration pattern, Joachim had followed his uncle Jürgen Goth (immigrated in 1854) and his brother Carl (1857). Today, descendants of the Goth family and other Mecklenburgers still live in the area. One of them, Carl Goth’s granddaughter Mae Goth Hartwig provided us with invaluable information about her family, family documents such as original letters, and stories of what life was like in this German-American community. Under the guidance of Mel Pope, three signs now have been posted where the cabin once stood. They inform visitors about the immigrant family that once lived there and the history of German immigration to the area in general. But this is only the beginning. 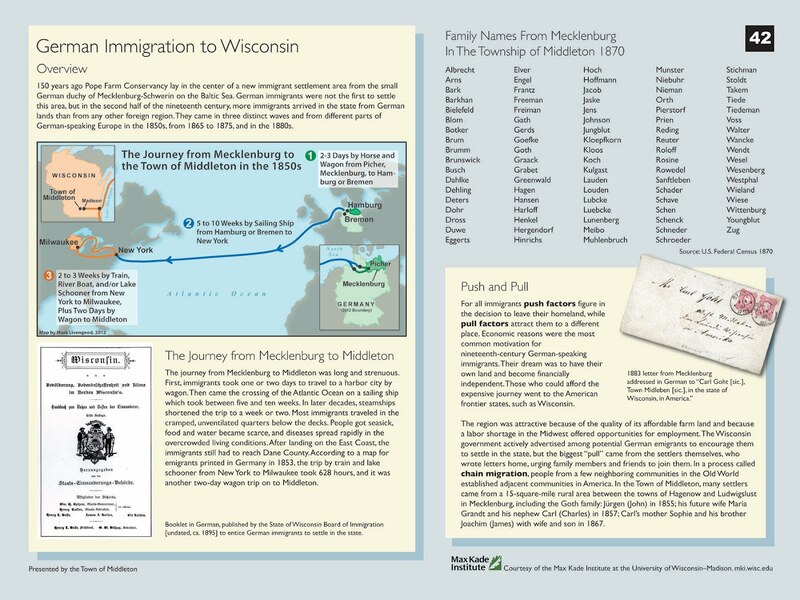 As we continue to research the history of settlers from Mecklenburg in the Town of Middleton, we will also develop educational materials and post resources on the MKI Web site. And we invite you all to come and visit Pope Farm Conservancy and experience German-American history in the rural landscape! We've leapt from the 19th to the 21st century -- check us out on Facebook! The Max Kade Institute for German-American Studies at the University of Wisconsin-Madison (MKI) turned 25 years old in October of 2008. 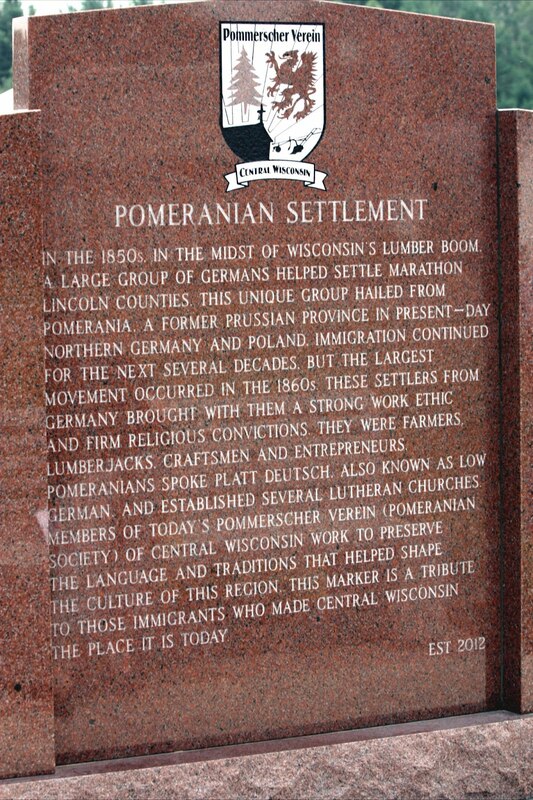 Sounds like a long time, but not much compared to the fact that the first German settlement in North America (Germantown, Pennsylvania) was established some 325 years ago. We've started this blog as a way to showcase some of the work we're doing. We also see it as an opportunity to examine the influence immigrants have had on America—-after all, except for the indigenous people of the Americas, we're all of immigrant stock here. We'll post some ideas that are running through our heads these days; we hope you'll find them of interest and will feel like offering your own comments.